Hanging on for dear life after losing everything, including his wife, Lance Underphal is hard to handle. The down and out freelance photographer wakes up plagued with visions of murders before they happen. It’s a curse. And only his dead wife can save him. 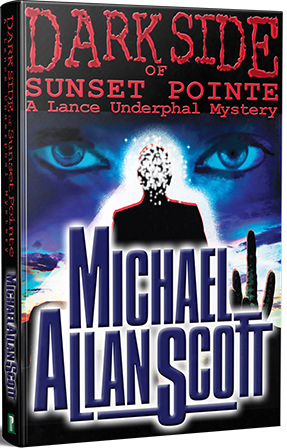 Featured on NBC’s Daytime Show, the first book in the Lance Underphal Mystery series is one of a new breed of mysteries and thrillers. Dark, different, and based on real-life events, this genre-bending murder mystery will keep you up nights guessing. Looking for a new spin on a venerable old story? This intensely moving novel will grab you by the eyeballs and won’t let go. Hard to read. Harder to put down. Treat yourself to a wild ride on the Dark Side.